I have had some friends and family ask where I came up the name with Love and Sapphire. Why sapphire? Seems kind of random, no? Well, me and Jonathan’s birthdays are both in September. His is the 15th and mine is the 30th. Although five years apart (I only say this because of remind him almost daily that he is older than me. Mainly for two reasons. First, declaring that my fiance is older than me makes me feel younger. Second, to remind him he should appreciate that a young hot lady like myself is marrying an old man like him. kidding!). Anyways, sapphire being our month’s birthstone has become my favorite gemstone. I think it looks classy but it also sentimental. 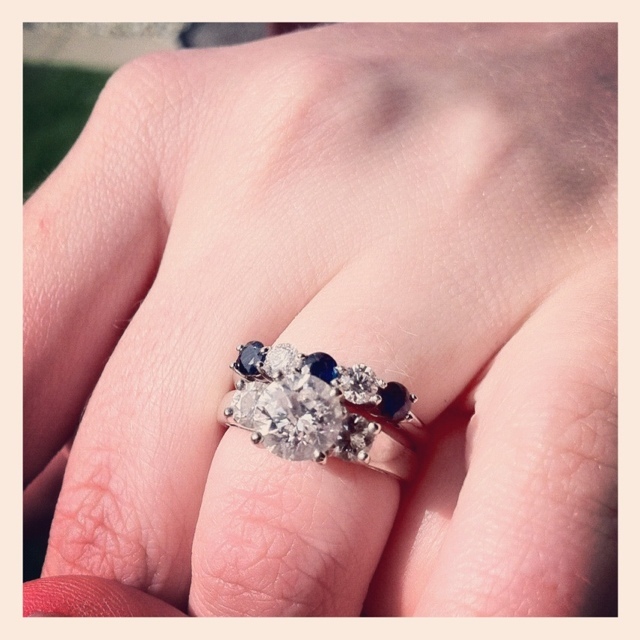 For this reason, when it came to wedding band shopping priority numero uno was to find a band with sapphires. Sapphires remind me of Jonathan and how lucky I am to have found such a genuinely loving and caring man to spend my life with. Ok, I’ll end the mushiness there. 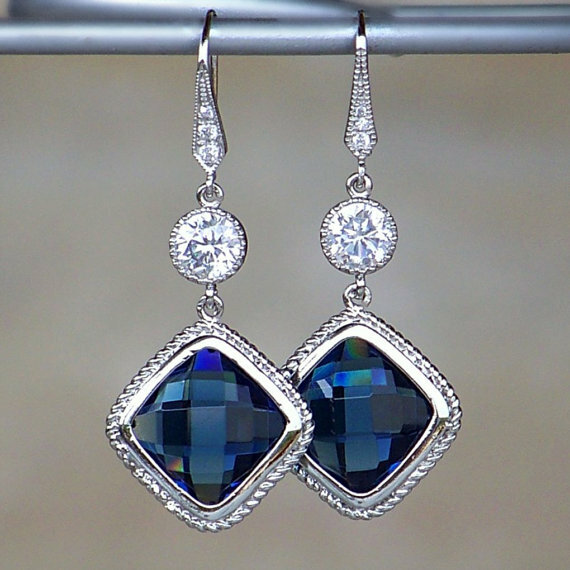 I plan on incorporating different touches of Sapphire throughout my wedding day accessories. First and foremost is my wedding band. Second is the bracelet I bought from Etsy that I mentioned here. I absolutely love it and think it will look great with my dress. My last accessory is the matching earrings from the same Etsy store. 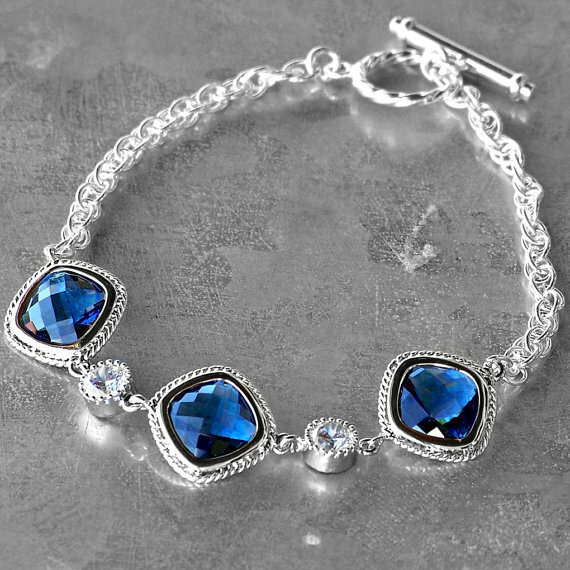 I contemplated buying them because I already had a pair that I bought 8 months ago from a sale on Gilt, but when I received the bracelet in the mail there was no question that the earrings would complete my look. I ordered them Monday and can not wait for them to arrive! The only thing that makes me a little nervous is that they are so long and seem a little big. I usually wear the same stud earrings from Tiffany’s every day so these seem gigantic; but if you can’t bling it out on your wedding day then when can ya? My first dress fitting in this weekend so I am crossing my fingers they make it to me by then. Does the name of your blog have a special meaning for you? Do you really like a certain gemstone?